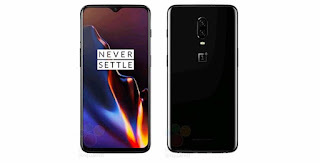 The OnePlus 6T is supposed to be coming sometime later this month, and while we know a bunch of things about the new smartphone, including the under-display fingerprint scanner, lack of a headphone jack, and a waterdrop notch, we now have a full look at what the new phone will look like thanks to leaked renders shared by WinFuture. The renders are what we expected the phone to be anyway, and they show only two cameras on the back, and no fingerprint scanner (since that's under the display now). While the specs haven't leaked out, it's a safe bet to assume a Snapdragon 845, 6/8GB of RAM, and 64/128GB of internal storage. We'll know more once the phone is official.